For more than 100 years Fordhook Farm has been the private home of W. Atlee Burpee, founder of the Burpee Seed Company, and his family. Nine major historic buildings constitute Fordhook Farm. 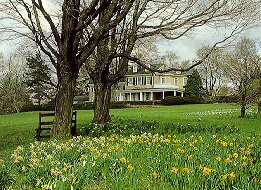 Three of these are used for the inn: the main house, which began as a typical mid-18th-century Pennsylvania fieldstone farmhouse, the two-story carriage house, built in 1868 and converted into a private library in 1915 (it features a Gothic-style great room with exposed beams and rafters and chestnut paneling); and the converted Bucks County-style barn. Guest rooms and common areas are filled with family antiques, furnishings, and mementos. There are 60 acres of meadows, woodlands, and gardens. Open: year round Accommodations: 7 guest rooms, 6 with private baths; 2 have working fireplaces; 1 is a suite. Meals: full breakfast included; complimentary refreshments; restaurants nearby. Rates: $195 - $350; Payment: AmEx, Visa, MC, personal and travelers checks Restrictions: children over 12 welcome; no smoking no pets. Activities gardens, paths through meadows and woods, badminton, croquet, cross-country skiing, tobogganing. This and other Doylestown Bed and Breakfast Inns can be found here in The Register.